It is adding up fast. In one of the largest Series C funding rounds ever raised by an Africa-focused startup, mobile lending app Branch International has raised $170 million. The round is led by Foundation Capital and Visa with participation from B Capital, Andreessen Horowitz, Formation 8, and Trinity Ventures. 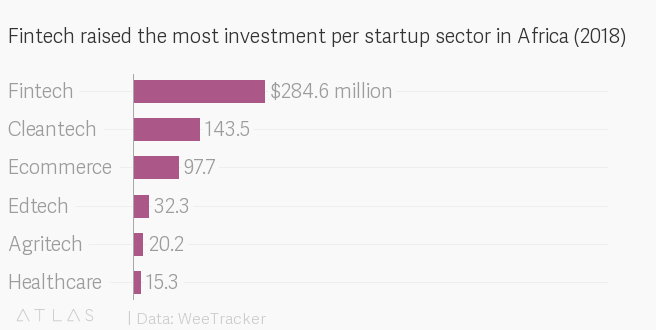 The funding comprises $100 million debt financing and $70 million in equity, according to Crunchbase. Branch International, which has more than 3 million users in Kenya, Nigeria, and Tanzania, as well as India and Mexico, uses smartphone data including GPS data, call logs, contact lists, and texts such as bank balance messages and bill payment receipts to determine credit worthiness. In Africa, it makes loans ranging from $2 to $700 for up to 68 weeks, charging interest rates of up to 21% in Nigeria and Tanzania and up to 14% in Kenya. Its model, also used by competitors like Tala (in Nigeria and Tanzania) and OneFi (in Nigeria), is an appealing fit for borrowers in emerging markets where access to credit through traditional banking systems remains a major barrier. Indeed, of the 10 parameters measured in the World Bank’s Doing Business report (pdf) for 2019, getting credit was ranked as the second-biggest problem when it comes to doing business in sub-Saharan Africa. Branch International has also announced a partnership with Visa, through which it will offer preferential loan terms to merchants in its Africa markets who accept Visa on mobile phones. As part of the Visa partnership, Branch International’s borrowers will also be able to withdraw their approved funds from local ATMs using virtual credentials, even without bank accounts or debit cards. The backing from Visa and the accompanying partnership is crucial to note, as it’s the latest in a streak that has seen global payments and finance giants, at least those looking for high-growth bets in emerging markets, backing Africa-focused fintech startups. In August 2018, Stripe and Visa led a $8 million Series A round in Paystack, a Nigerian payments company. Two months later, Mastercard participated in a $20 million Series A extension round in another Nigerian startup, Flutterwave. Former Visa CEO Joe Saunders, now the chairman of Green Visor Capital—which led the round—joined Flutterwave’s board of directors as part of the round. Meanwhile, PayPal has backed Tala, an online lender operating in Kenya and Tanzania. Branch’s latest funding round further cements fintech’s reputation as the sector in Africa most coveted by investors. 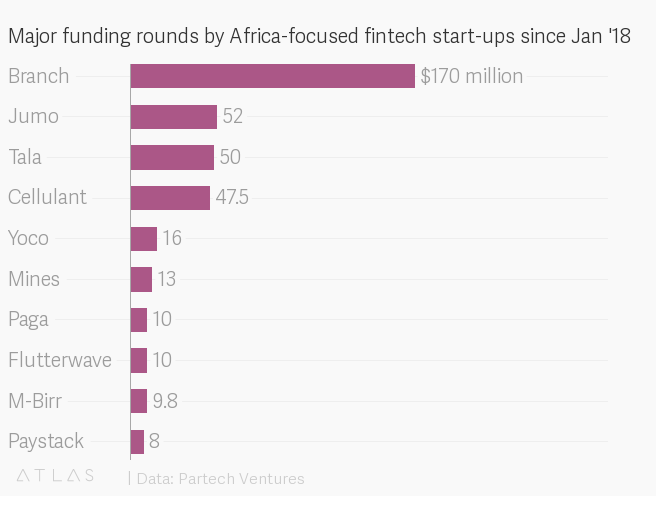 Fintech took nearly a third of all African venture funding in 2017 and was the most funded sector across the continent last year. Sign up to the Quartz Africa Weekly Brief here for news and analysis on African business, tech, and innovation, delivered to your inbox.